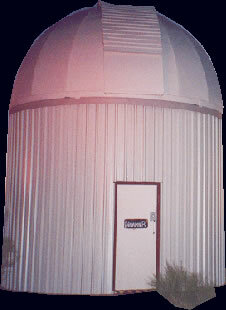 The Observatory measures 5 metres in diametre, has a rotating dome set on top of a circular room. The mezzanine floor is accessed by a contoured staircase which is easy to climb. There is a viewing area adjacent to the Observatory. A knowledge of the sky is not necessary as Adrian will guide you around the different telescopes and binoculars alerting you to the wonderful formations. The Telescopes include a (310mm) cassagrain on equatorial mount, (200mm) dobsonion mounted newtonion type and 20x80 binoculars. 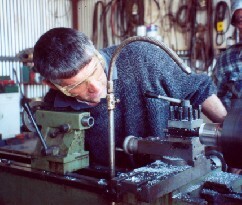 Local farmer, Peter Heinrich turning up a converter sleeve to enable fitment of 2" eyepieces to the telescope.